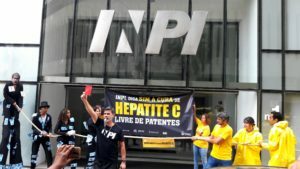 In Rio de Janeiro activists demand INPI to reject the patent. 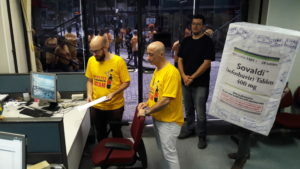 In São Paulo, activists remembered the deaths due to lack of access in front of Gilead’s office. INPI’s rejection of this patent is the last remaining decision in order to secure the entry of generic versions of sofosbuvir in the Brazilian market, which would expand access to treatment for the disease that affects more than one million people in the country. A motion was delivered to the INPI headquarters. The document calls for the rejection of the patent application signed by 222 health professionals and public health experts. The motion was approved at the 12th Brazilian Public Health Congress, attended by more than 8,000 participants. In May 2018, the Brazilian drug regulatory agency (ANVISA) published the market authorization for a locally produced generic. According to a negotiation initiated by the Ministry of Health, the entry of the local generic competitor could reduce treatment cost by 80%, enabling expanded treatment and saving the public health system more than one billion reais (approx $250,000 USD). In Rio de Janeiro, the protesters used the sidewalk in front of INPI headquarters to play out the dispute over the drug. Gilead, represented by a giant executive was on one side and, on the other, the people in need of treatment were represented in yellow. A referee, in the middle, represented INPI, who has to decide in the next few days if it will grant the patent or not. 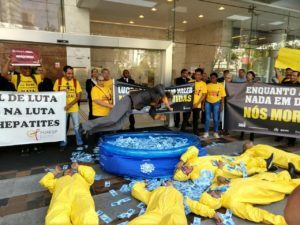 An executive dived into a pool fulled of money in front of the Gilead’s office in São Paulo, surrounded by people lying down and wearing yellow. “While Gilead swims in money, we die”, was written in one of the bands.